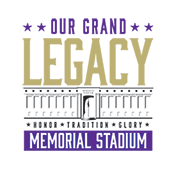 On January 21, 2019 the Grand Island community gathered to celebrate the historic groundbreaking for our new West Grandstand and the preservation and renovation of the East Grandstand at our Memorial Stadium. Community members, donors, students, faculty, project committee members, as well as members of both the Grand Island Board of Education and the Grand Island Public Schools Foundation were in attendance. The program included a Presentation of Colors, performances from the GISH Pep Band and Madrigals, as well as the GISH Cheerleaders. Remarks were given by Dr. Grover, Superintendent of Schools, and Mr. Lanny Martin who gave $10 million to start the project in honor of his late father, Mr. Jack Martin. During the ceremony the fundraising total for the primary project was announced at $13,911,000 which is 90% of the $15.3 million dollar primary goal. Mr. Jim Kahrhoff, Committee Co-Chair, encouraged the community to give, because every gift helps provide a brighter future for Grand Island. Please visit our event photo gallery below.